Scanned leaves, flowers and debris. 100% SHADOW-LESS CAPTURE with Pristine albedos. Our albedo maps are not polluted with any remaining lighting information, clean as a whistle! While at first glance it may look like the colors are too dark, this is exactly how a material looks if you remove all specular lighting and only the pure albedo color remains. A pure albedo color means accurate lighting under any lighting condition. Our new scanner and software captures more detail than ever by using more than 20 light vectors. In comparison, off the shelf scanning software supports 8 light vectors at most. Using more light vectors means more accurate and smoother normals and less shading artefacts. 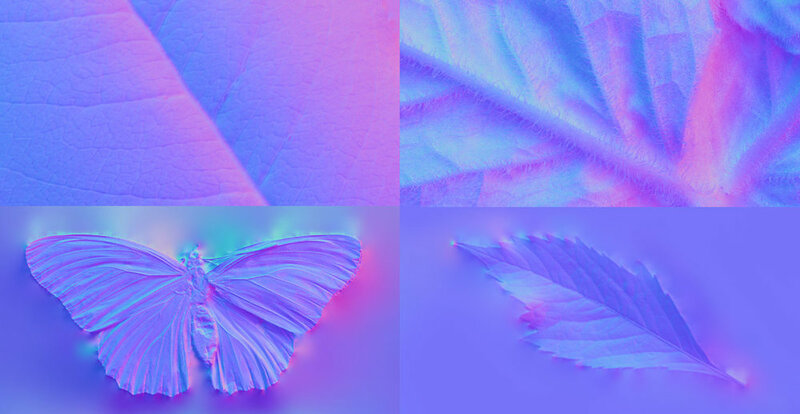 From velvety smooth curves to razor thin details on the wings of a butterfly, it's all captured in the normal maps. Leaves, flowers, bark and butterflies. Because who doesn't love butterflies? Highest Resolution on the market with Over 300 atlases available right now. From flowers to tree branches, we got you covered! Each atlas feature enough diversity to fill even large areas without visible repetition. Retina foliage? Call it as you like, no need to be afraid of IMAX closeups anymore! From 4K all the way to 20K, there is plenty of resolution to spare. All atlas scans contain 4K preview renders. 5 different lighting conditions give you the perfect glimpse into what you can expect. All atlas scans feature a ruler (visible on the albedo map), in inches and cm. Say goodbye to "eyeballed" values. More to be added, requests welcome! - In any case, our comment section is always open for requests, speak your mind out!